In order to meet global and national ressource supply challenges, hydrometallurgical and especially biohydrometallurgical approaches to metal winning will have to play an important role in future. 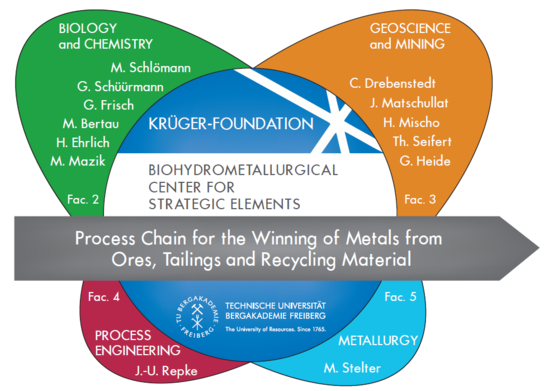 Therefore, TU Bergakademie Freiberg (TUBAF) with funding by the Dr.-Erich Krüger foundation established the Biohydrometallurgical Center for Strategic Elements (“BHMZ”) as a Krüger Research School to forward interdisciplinary research along the whole (bio-)hydrometallurgical process chain. This comprises bringing the respective metal from the respective source material (deposits, tailings/heaps, recycling material) into aqueous solution and various approaches to obtain pure metal or metal-containing materials of interest from the solution. Ph. D students funded by the Krüger Research School will focus their research on indium and germanium, two elements of strategic importance, both of which have been detected in the 19ᵗʰ century by scientists of TU Bergakademie. However, the experiences gained in the Krüger Research School with indium and germanium can also be applied to other metals of interest. Overall, the vision of BHMZ aims at forwarding research into environmentally acceptable mining of strategic metals and thereby improving sustainable economic development. Besides the involved professorships, other associated groups with interest in aspects of the biohydrometallurgical process chain contribute to teaching activities in the research school or are involved in common research projects. The BHMZ is supported by an advisory board which comprises company representatives with interest in (bio-)hydrometallurgy as well as representatives of the Helmholtz Institute Freiberg, the mining authorities of the state of Saxony (Sächsisches Oberbergamt), the chamber of industry and commerce Chemnitz, and professors of other universities.